The OP Financial Group is among the leading financial services groups in Finland and it serves more than a million customers in the country. Often referred to as OP-Pohjola, its former name, it offers a vast range of banking, investment, and insurance services. As one of the most trusted banks in the country, the financial group is a preferred payment services provider for many Finnish casino players, as well. The group was founded more than a hundred years ago and over the past century, it has established itself as a leader in the development and supply of new and innovative financial services in Finland and the Baltic region. In 1996, the OP eServices was launched as the first online bank in Europe and in 2006, the OP became Pohjola Group plc’s largest shareholder. Several years after that, the OP-Pohjola Group shortened its name to OP. Interestingly, the financial group is made of approximately 180 cooperative banks and is fully owned by its customers in terms of ownership structure. In fact, the bank has around 1.4 million owner-customers, as it calls them. The online banking offered by the OP remains one of the most preferred electronic payment methods in the country despite the strong competition by world-leading credit card issuers and e-wallet providers. This service provides a secure and convenient way for Finnish customers to shop online, pay their bills, and even play slots and other casino games on the Internet. As a casino payment method, OP’s online banking service is very popular and most Finland-friendly casinos on the web accept it for deposits. In order to use OP’s online banking service for deposits and withdrawals in web-based casinos, players first have to be OP customers. Only Finnish citizens are eligible for registering an account, although the bank has a branch in Estonia, as well. There, it operates as a corporate bank for large and medium-sized companies and offers no services to individual customers. Casino players based in Finland can easily apply online for a user account by submitting a simple form with their personal information (personal ID code, current bank, and phone number) and the KYC (Know Your Customer) information. They also need to comply with the OP eServices Agreement after receiving a text message that they have been approved. The bank will send it within two days and in a few more days, it will also send the account and eServices agreements to the customer’s address, along with a list of key codes. The key codes are one-time security codes used when the customer logs in to the system, confirms a payment, or sign agreements. The last step is receiving the OP service user identifiers, needed for logging in to the online banking account. These user identifiers, as the bank refers to them, are simply the credentials used for logging in the system (user name and password). After moving their funds from the bank they previously had an account with, casino players then need to choose OP’s online bank transfer from the list of available deposit options on the casino’s Cashier page. It may be listed as Online Bank Transfer, Bank Transfer, or OP-Pohjola. Customers will be redirected at the bank’s online platform, where they will need to sign in, specify the amount they wish to deposit into the casino and confirm the transaction. The deposited funds will be transferred immediately from the player’s bank account in OP to his or her casino balance. The transfer is instantaneous and the customer is free to play real-money casino games right away. There are no fees charged by the bank for deposits into online casinos and the financial transaction is completely secure. Another thing that needs to be clarified is whether OP’s online bank transfer can be used for withdrawing your winnings from the gambling site. Most online casinos do not pay out winnings via bank transfer and even if they do, the bank may cancel the payment. Usually, withdrawals are made through bank wires, cash transfers, checks or digital wallets. When choosing a good and reliable casino deposit method, players should take several main factors into consideration. One of them is the speed of the transactions and with OP-Pohjola, casino patrons can fund their gambling balances instantly. The depositing process is quite simple and straightforward and you can start playing in the casino within minutes. Moreover, players use the familiar interface of their own bank and the method they already use for paying their bills, for shopping, etc. Indeed, the convenience of these online bank transfers is very important to the customers, especially if they have no desire to set up new accounts with some other payment processors just for playing casino games online. The OP Financial Group is a widely respected and trustworthy bank, so its services, including online banking, are dependable and reliable enough. Customers can also enjoy many other perks that come with the OP user account – they can apply for credit and debit cards, make use of OP’s mobile banking option, apply for credit, and many others. Another obvious advantage of using this method for making deposits into online casinos is that the bank charges no fees for these transactions. In contrast, some banks, as well as some credit card issuers and other financial services providers, tend to impose small fees for payments by the customer. Players should know that certain casinos might also process deposits at a fee. The online bank transfers carried out by OP come with high levels of security, which is extremely important in a time when cybercrime rates have exploded compared to only a few years ago. Electronic transactions are associated with various risks such as fraud, stolen funds, and identity theft. This is why many banks, especially those in the Nordic countries, have implemented multiple security policies and tools to increase the safety of each financial transaction. The Finnish cooperative bank is not an exception and in fact, it has one of the most sophisticated security systems today. Advantages and Disadvantages Additional TipsOP-Pohjola also comes with certain weaknesses and limitations that need to be mentioned, if we are to be unbiased. Obviously, this is not the most ideal payment method for casino gambling and just like any other option, it has several disadvantages. Of course, some are more crucial than others and the one that probably creates the biggest obstacles to customers is the long and complex registration process. Those who do not have a customer account at any of the branches or subsidiaries of the OP Financial Group would need around two weeks until they can use the bank’s online services. This is way too much for most people, especially when compared to other common casino payment methods that do not even require registration such as prepaid cards, for instance. Moreover, casino players who decide to apply for an OP account online rather than in one of the hundreds of local branches of the bank will receive the required documentation by mail. In some cases, the entire registration and verification process could take more than two weeks to complete. As mentioned above, this payment method is available only to Finnish customers who reside in the country and have a good credit score at the OP financial group or at any other bank in Finland. Payments are processed in Euro (EUR) and if the transaction is international and not in EUR, additional charges and exchange fees will apply. This may discourage some players from visiting foreign online casinos. In addition, OP’s online banking service is rarely offered as a withdrawal method at web-based casinos. Players who wish to use their OP eServices to make a deposit will need to choose another way to withdraw their winnings. 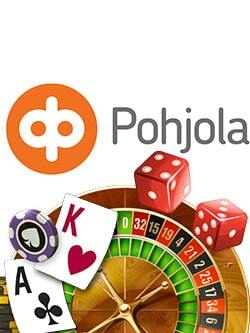 Compared to most payment methods offered by online casinos, OP-Pohjola is an affordable way to fund your gambling balance. The registration of the eServices account is free and there is a monthly fee of up to €2.70 (it could be even lower for some customers). As the main operational currency of the OP bank is EUR, there are no service fees for online transfers in EUR to countries within the European Union. However, the bank charges non-Euro payments and transfers to non-SEPA countries certain fees, which vary depending on the country of the payee. For this reason, your deposits into online casinos will be free of charge as long as they are in EUR. In case withdrawals are allowed, they will be charged a processing fee but its exact amount will depend on the casino you play at, the country where it is based in, and the amount of the withdrawal. In addition, there are also fees associated with using credit and debit cards by OP, but they are separate from the online banking service. There are also discounts for owner-customers of the bank – for instance, instead of paying €5.45 per month for a current account, OP eServices, and OP-Visa, owner-customers pay only €2.95 per month for the three different products. OP’s online banking facilitates electronic funds transfers (EFT), which are an electronic transfer of money through computer-based systems. These transactions are automatic and, therefore, almost instantaneous whereas bank wires and cash transfers are conducted manually, at least in part. With online baking, there is no intervention of the bank staff and the only reason for delays is the verification and authorization processes payments must go through (which are automatic, as well). This is why casino deposits via OP-Pohjola are processed immediately and players can enjoy real-money games within minutes after confirming the deposit transaction. Of course, in some cases, the transfer may take a few hours to reach customers’ gaming balances. The exact processing times would vary across the different casinos and, once again, would depend on several factors such as the country where the casino is based. 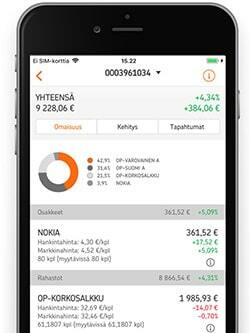 Known as an innovator in the banking and financial services sector, the Finnish bank group has fully embraced mobile payments and is now allowing its customers to enjoy most of its products and services directly from their phones or tablets. There are several ways casino players can deposit via OP’s mobile banking, the first one of which is by opening the site of the bank directly in the browser of their mobile device. Its design is mobile-friendly, so they can easily sign in, make a deposit, and continue to the casino where they can play real-money games right away. The other method is preferred by players, however, and it is by accessing the OP mobile banking service via a native app. The application can be downloaded for free from the App Store, Google Play, and Microsoft Store, and it allows users to make convenient payments, track their transactions history, manage their insurance covers and investor products, and more. The app is available in Finnish, Swedish, and English. Using the mobile banking service requires a mobile subscription that allows sending and receiving text messages. In order to use the iOS app, customers need to make sure their device runs on iOS 9.0 (or newer) and that they have an Apple ID user account. The application also requires Android 5.0 or later, while for Windows devices, they need at least Windows 10. OP’s online banking service has a vast range of security features designed to prevent data theft, unauthorized access to customer’s bank accounts, and various other risks. The bank’s eServices product is protected by digital encryption and uses HTTPS connection with TLS (Transport Layer Security) protocols. This guarantees that no third party would access users’ sensitive information such as names, addresses, bank details, etc. The one-time key codes provided by the bank add another layer of protection for the customer account and for each and every financial transaction carried out online. Once casino players register an account with the bank, they receive a list of key codes and every time they log in, they need to enter one of these codes (a random one) alongside their username and password. In order to confirm a payment, whether they pay a bill or make a casino deposit, they also enter any of these codes. The system tracks the number of used codes and once the customer has only 20 codes left, it sends a new list of key codes. In addition, the bank sends an SMS upon making a payment. It contains all the details of the transaction and if they are correct, you can proceed to confirm the transfer. Is OP-Pohjola available outside Finland? Yes, the OP Financial Group offers some of its services to corporate clients in Estonia and Sweden. However, it is available to individual customers in Finland only. When applying for any of its products or services, including its online banking, customers need to prove they are Finnish citizens. Can I use this payment method to withdraw my casino winnings? Some casino would offer online bank transfers by OP for withdrawals but in the majority of the cases, the method cannot be used for transactions of this kind. Still, customers who have Mastercard or Visa cards from OP can use them to move their funds from the casino to their cards and bank accounts. Can I deposit funds into a foreign casino? Yes, OP’s eService allows customers to make fast and easy payments to individuals and merchants all over the world. Payments in a currency different from EUR, as well as payments to non-SEPA countries, however, come with a service fee that must be taken into account. Is the list of key codes important? Yes, you receive a list of unique key codes that are used only one time when logging in and confirming a transaction. They function as additional protection and guarantee that no one would be able to get access to your user account or see your financial transactions. The list of codes will be automatically renewed when your codes are almost depleted.